This cross shaped wordsearch puzzle grid is blank so students can engage their creativity while learning vocabualry along the way. 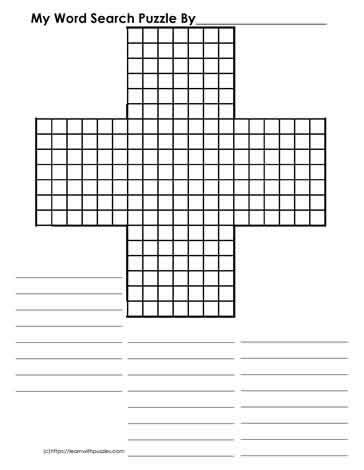 Use this blank shaped puzzle form in areas of math (addition); Religion (cross shaped); language (lower case 't') and seasonal themes (Christmas). Have the kids share their thoughts about what other areas of learning this blank puzzle form can be used.